Dan Gosling might have argued afterwards the scoreline flattered Manchester United, but another heavy defeat has added to the pressure on Newcastle United manager Alan Pardew. While a mid-table finish is all but guaranteed, the statistics stacking up against the Magpies are extremely worrying. The last three games have ended in heavy defeats, with 11 goals conceded and none scored, but the malaise extends back to Boxing Day. Since then Newcastle have failed to score in 11 of 15 matches. Seven of the nine home games in all competitions have been lost. So even if – and it is a big if – Gosling was right to argue Saturday’s 4-0 scoreline was not a fair reflection of the 90 minutes, many fans are coming to the conclusion a change of manager is needed. “The result doesn’t actually reflect what went on, I think we were better than the scoreline suggests,” argued the midfielder, after only his second Premier League start since joining from Everton in 2010. Newcastle had been the better side until Juan Mata curled in a 39th-minute free-kick, but from that point on they failed to contest the game. Had the Red Devils not been more concerned with preserving energy ahead of Wednesday’s European Cup quarter-final second leg at Bayern Munich, they would surely have scored further goals. Mata had his opportunity to open the scoring because Gosling tackled Darren Fletcher from the wrong side just beyond Newcastle’s penalty area. The Spaniard doubled the lead five minutes after the interval, with Javier Hernandez and Adnan Januzaj completing what became an easy away win. Gosling added: “There could have been an offside in the build-up to the move which ended in a free-kick and Mata scored it. “Even Fletcher told me he didn’t think it was a foul. “They only had four shots really, our goalkeeper (Rob Elliot) didn’t make many saves I don’t think. I think 4-0 flatters them a lot. 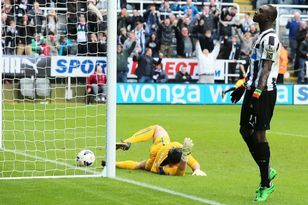 “Papiss (Cisse) had two shots, the goalkeeper (Anders Lindegaard) pulled off some good save, and we could have had a few (goals) last week too. Given he will be out of contract at the end of the season, Gosling had every incentive to perform and he countered the suggestion his team-mates are coasting towards the end of the season. He said: “It was nice to play and to try to help the team. “I want to play every week. We will see how training goes and I will respect the manager’s decision for his team (to travel to Stoke City on Saturday). “The game was tight until the second goal, which arrived from a mistake (By Fabricio Coloccini). “If you are two down against Man United it’s going to be difficult. No matter how tough they have had it this season they are still a top, top side. “The lads are not going out there thinking about their summer holidays. Totally not. We are trying to win games. “We are not conceding goals on purpose. We have played three very good sides lately (Everton, Southampton and Manchester United) and they are all above us in the league and have bigger squads than we have. “We are probably second in our mini-league, Southampton are above us by two points. “We are still chasing them down and if we finish eighth it will be a great season. “The Britannia (Stadium, home of Stoke) is a tough place to go next too. Stoke turn over teams on a regular basis there. Although murmurings of discontent were few and far between in what – the away end apart – was an extremely subdued St James’s Park, there was an angry reaction against Pardew on social media after the game. It did not help during a post-match press conference in which he insisted the root of Newcastle’s poor form was the absence of key players – Loic Remy, Tim Krul, Mathieu Debuchy and Moussa Sissoko were all injured – the Londoner kept referring to the away team as “United”. More alarming than the gap in ability between the sides – and Manchester United were without the injured Wayne Rooney, Robin van Persie, Jonny Evans, Rafael da Silva and Ryan Giggs and the rested Danny Welbeck, Michael Carrick and Rio Ferdinand – was the complete lack of appetite the Magpies showed once behind.